We are glad to invite you on the opening of Photo Exhibition “ART Bridge” on Tbilisoba, October 25, 14:00. On the exhibition we will present photo/Video material from 20 countries of Europe. Project is a trinational initiative, which unites three twin cities: Tbilisi, Nantes and Saarbrucken. The aim of the project is to explore and present to wider public topics, such as conflicts, bariers and identities, which divide and same time unite countries and societies from Nantes to Tbilisi. 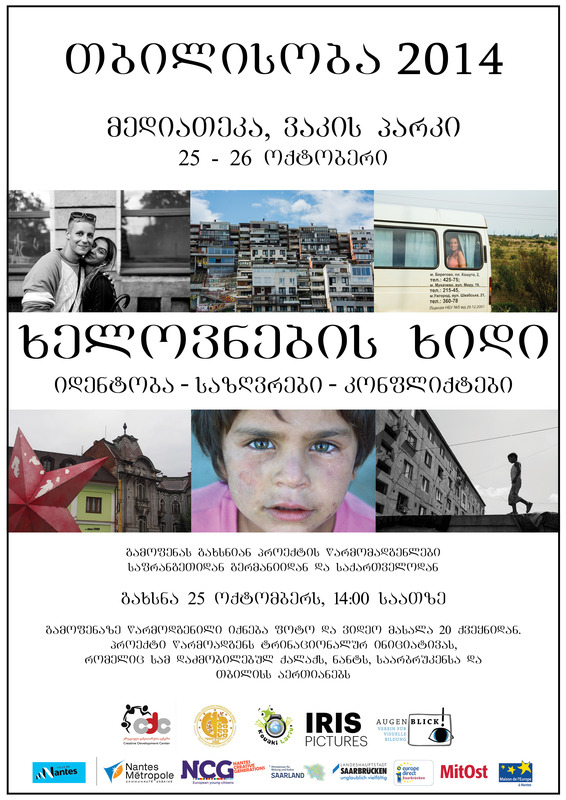 In August 2014 6 photographers from Georgia, Germany and France organized Auto tour and gathered Photo, as well as video and audio materials from border zones of 20 countries. Exhibition will be hosted by Mediathek, which is located in Vake Park. Exhibiton will end on October 26. 25 ოქტომბერს 14:00 საათზე გეპატიჟებით თბილისობის დღესასწაულის ფარგლებში გამართულ გამოფენის “ხელოვნების ხიდი” გახსნაზე. გამოფენაზე წარმოდგენილი იქნება ფოტო და ვიდეო მასალა ევროპის 20 ქვეყნიდან, ასევე კავკასიიდან. პროექტი წარმოადგენს ტრინაციონალურ ინიციატივას, რომელიც სამ დაძმობილებულ ქალაქს, ნანტს, საარბრუკენსა და თბილისს აერთიანებს. პროექტის მიზანია შეისწავლოს და საზოგადოებამდე მიიტანოს ისეთი საკითხები, როგორიცაა კონფლიქტები, ბარიერები და იდენტობასთან დაკავშირეული საკითხები, რომელიც ყოფს და ამავე დროს აერთიანებს ქვეყნებს ნანტიდან თბილისამდე. ამა წლის აგვისტოში განხორციელდა ავტოტური, რომლის ფარგლებშიც 6 ფოტოგრაფი საქართველოდან, საფრნგეთიდან და გერმანიიდან აგროვებდა როგორც ფოტო, ასევე ვიდეო და აუდიო მასალას აღნიშნულ თემატიკასთან დაკავშირებით. ფოტოგრაფებმა მოინახულეს 20 ქვეყნის სასაზღვრო დასახლება.